“Ejecta” may not be the weirdest Under The Dome episode ever, but it’s probably the weirdest episode that didn’t make me want to hunt down the writers and take away their laptops. It would be a stretch to say the show has attained respectability, but tonight’s episode had its share of oddly compelling moments and genuinely entertaining developments. On the surface it’s yet another “disaster-of-the-week” installment, given that the primary plot point is a meteor shower that apparently wipes out all life on Earth outside the dome. But the key words there are “outside the dome”; this is a muted, abstracted apocalypse that our characters can only process in a detached manner, at least until the final act when Barbie comes face to face with survivors only inches away but impossibly out of reach. The extinction event, as Eva terms it, is instantly recognizable to those of us who have been following the convoluted Dome mythology from the beginning: It’s the pink stars falling in lines. (Just in case anyone didn’t pick up on that, it’s mentioned numerous times throughout the episode.) In other words, it’s yet another attempt to wrangle the random nonsense from the first two seasons into a coherent storyline and make it look like the writers have known what they’re doing all along. That ship has sailed, but the way the meteor shower is used here is actually kind of fascinating. ”Ejecta” (named for the secondary impact of the fragments spawned from the initial meteor crash) has a rewinding structure that takes us through the night of falling stars through the eyes of various pairings and groups. First up are Barbie and Eva, who go to the top of the fire lookout tower to survey the damage. The dome has held up, but the key to the hatch disappears (and why a key would be needed to get back out of the hatch is something best not dwelled upon), so they pull an all-nighter watching the end of the world as we know it. They’re surreally calm about the whole thing, which makes the sequence play like a peculiar little one-act play as they discuss their options. (Barbie wants to get word to the outside world about the red door into the dome, but Eva points out that the only ones to get through would be the most ruthless of the survivors, who would then be trapped with them.) When Barbie starts wavering, Eva takes her shirt off, but somehow he is able to resist and set out for Bird Island and whatever communication facilities he can find there. The best pairing of all is Julia and Big Jim on Bird Island, where they become convinced they’re the last two humans on earth. They get drunk and banter and I’ve never enjoyed these two characters more. (Let me be clear, however, that I’m not advocating any kind of Big Julia shipping here. I’ll leave that to you in the comments.) I probably could have watched a whole bottle episode about the two of them getting ripped on the good stuff and pointing out each other’s flaws, but Chester’s Millennials show up just in time to tell them there’s a way to free the drones from Christine’s influence. Just as Barbie feared, survivors of the outside cataclysm have reached the edge of the dome and are desperate to get inside. It’s a grimly ironic inversion of the dynamic we saw so often in the early days of this show, and it ends in surprisingly dark fashion with Barbie walking away hand-in-hand with Eva while the outsiders are engulfed in flame. But is that really what happened? An unheard communication from the outside on the Bird Island computer suggests that all is not lost, and there’s always the possibility that this whole thing was just a show put on by the dome to aid Christine’s cause. 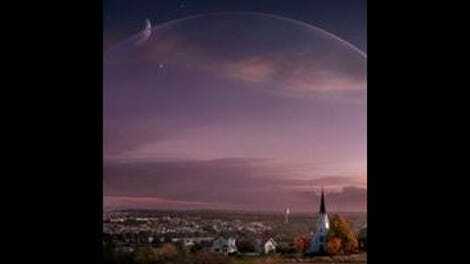 Whatever the case, I’m trying to come to grips with an unfamiliar feeling: caring about what happens next on Under The Dome. This was a more nostalgic episode than usual. Barbie sees “Rusty loves Linda” graffiti in the fire tower and recalls how our favorite dumb deputy died when the dome was magnetized. Julia is reminded she used to have a husband, and apropos of nothing, Big Jim says “Remember that time everything froze?” It’s another admirable if doomed attempt at making it seem like the show has been telling a consistent, intelligible story all along. If any doubts remains about alien involvement in Chester’s Mill, Junior’s talk about the “destruction of our home world” should dispel them. Indy the dog status: Alive and well.